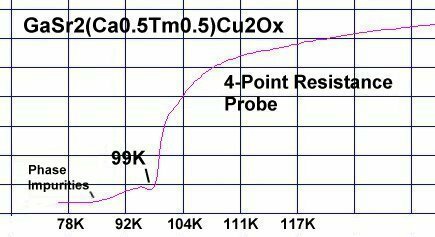 Superconductors.ORG herein reports a 29 degree improvement in the critical transition temperature of GaSr2(Ca,Y)Cu2O7 when thulium is substituted into the yttrium atomic site and the stoichiometric ratio of (Ca,Tm) is set at 50-50. This is believed to be the highest Tc for a superconductive gallium copper-oxide. Like the discovery of "Super YBCO" in November 2005, Ga-1212 (Tc~70K) showed a marked increase in Tc after the CuO2 planar weight ratios were increased. 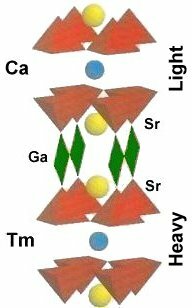 In the improved Ga-1212 formulation, [heavier] thulium is alternated with calcium, increasing the planar weight ratios by a factor of nearly 2. The above plot shows a sharp resistive transition near 99K with thulium substitution. An unknown minority phase can also be seen. This discovery was the 12th new superconductor created using planar weight disparity as a Tc enhancement mechanism. RESEARCH NOTE: Thulium copper-oxides have been found to be strongly hygroscopic and degrade rapidly when exposed to air. All tests should be performed immediately after annealing. Synthesis of the material was by the solid state reaction method. Stoichiometric amounts of the below precursors were mixed, pelletized and sintered for 11 hours at 890C. The pellet was then annealed for 9-10 hours at 500C in flowing O2.